Tata Steel has announced that 1,200 jobs will go in Scunthorpe and Lanarkshire, dealing another blow to an industry reeling from collapsing prices. They are the latest in a series of job losses across the UK steel sector, following news that administrators have been appointed to parts of Caparo Industries' steel operations. And earlier this month, it was announced that the coke ovens and blast furnace at Redcar steelworks will close after no offers to buy them were received. The works had been in the hands of receivers since the site's owner, Sahaviriya Steel Industries UK (SSI), was wound up on 2 October. In all, 2,200 jobs will be lost there. The new Labour leader, Jeremy Corbyn, spoke about the Redcar steel workers in his party conference speech last month. "It is not too late now, again, to call on the prime minister even at this very late stage, this 12th hour, to step in and defend those people." "Other governments like the Italian government have done the same. Why can't the British government? What is wrong with them?" he asked. Unions also called on the government to step in and rescue the plant, but the government has said it is not allowed to do so. Business Minister Anna Soubry said: "There are extremely strict state aid rules, which especially apply to the steel industry, so we are limited as to what we can do. "We can put money into things like research and development. But simply giving a loan or underwriting things, we cannot do. "Things are extremely difficult at SSI, but our hands are tied." At first glance, the government is correct on this point. EU state aid rules do not allow aid such as emergency loans or government guarantees on loans to steel manufacturers in financial difficulties. The European Commission says this is because of its past experience with steel, and taking into account the features of the EU steel industry - in particular. its overcapacity. Governments are allowed to support things like research and development in the steel industry, but as soon as a plant is in financial difficulties, there are limitations on what can be done. So what of Mr Corbyn's reference to the Italian government supporting its steel industry? Gareth Stace, from the industry body UK Steel, says: "There is a site in Southern Italy called Ilva - the government has given them €100m ($112; £74m) supposedly for environmental improvements, but some commentators would say it is to run the site. "We made a submission to the Commission supporting a complaint suggesting it's illegal state aid. Trade union umbrella body the TUC compares the government's record of supporting industry unfavourably with other EU member states. Mr Stace from UK Steel agrees: "In Germany, government is the friend of industry," he says. "Here, you wonder what is behind the rhetoric of a northern powerhouse if a company like SSI in Redcar can be allowed to go out of business." The TUC also questions whether France or Germany would allow such strategic industries to fail. The government stresses the support that it has managed to get EU permission to give to energy-intensive industries, including steel, to compensate them for the extra costs of climate change policies. The TUC says the scheme will give £60m to 53 firms this year. The government says it has paid £37m so far this year and expects to have paid £81m by the end of the year. That includes £34m going to steel companies. The TUC says that the steel industry reckons it is still paying about 70% of the additional costs while some competitors in other European countries are having all of the additional costs covered. The government says it is looking at additional areas where it can provide relief for such companies, but has not yet had EU clearance for them. The remaining parts of the package are supposed to cover the additional costs of renewable energy. It is due to come in next month, and UK Steel says it will bring UK firms broadly in line with their European competitors. "I think they're hiding behind the understanding that the wheels of the Commission turn very slowly," Mr Stace says. "But the application has been in since February," he adds, and wonders if there isn't some way the government could speed up the process. Meanwhile, the industry says that there are big competitive problems coming from outside the EU, especially China, which has been accused of dumping steel (selling it at uneconomic prices) in the UK. The government voted in July for the extension of EU anti-dumping measures on Chinese wire rod products, and says it will consider further cases as they arise. UK Steel warmly welcomed that, and had particular praise for the minister, Ms Soubry, given that the UK government has "traditionally voted against anti-dumping measures", according to Mr Stace, but he wonders if again there isn't some way that the European process could be sped up. "When a potential case of dumping is found, the EU takes a year to investigate," he says. "In the US, it takes a matter of weeks." So the government is right to say that there are specific rules preventing aid to the iron and steel industries, but the TUC says that the government should nonetheless apply for state aid permission to support steel in the way that other countries have supported their coal industries, through three to five year programmes. "Either the sector returns to viability and repays the money or it closes down and doesn't," says Philip Pearson, who is in charge of energy and environment policy at the TUC. Even if that's not possible, the industry wants to see the government trying to speed up the work of the European Commission so that there will be a level playing field sooner. And Mr Corbyn wonders why the UK cannot just ignore the rules, as the Italian government is alleged to have done. 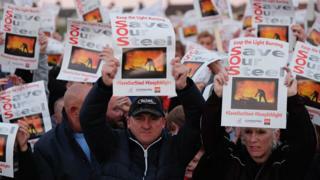 How important is the Redcar steel plant?